I was thrilled to find out that I wouldn’t need a rigorous exercise program. I’ve never been inclined towards “killer exercise,” and wouldn’t choose to spend all my free time in retirement that way. But two to five hours a week of low level aerobics like walking, biking or swimming? Sign me up! I do a swim/exercise class twice each week for an hour, so that’s enough right there. But I’m also happy to do a low-level exercise class once or twice a week, and an hour of yoga another day, and walks and bike rides in the summer months. But I’ve also learned from Mark that what you really need to be doing is moving around the way our evolutionary ancestors did – a little bit, but consistently. Grok the Caveman (see the Primal Blueprint logo) did this naturally. I have a slightly more high tech way to remember to move – my Fitbit. It nudges me at 10 minutes before the hour if I haven’t done something that amounts to 250 steps in the prior 50 minutes. Just what I need to keep me moving! In fact, I’ve just been “nudged” to go there now! 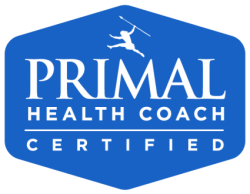 See you next week with Primal Blueprint Law #3.